Incontinence products that really work! 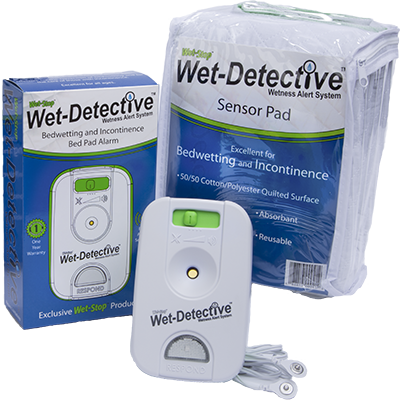 Manage or overcome incontinence in adults with products that really work—including the Wet-Detective alarm system and Wet-Stop Mattress covers and pads. Developed by urology experts and specially designed to help those struggling with adult incontinence and bedwetting issues, our patented products and system are also effective with children. They can even alert you to problems with pets! Sensors in the pad react to moisture and activate the alarm for a quick response to the situation, faster clean-up, and better outcomes. Use a sensor pad on beds, chairs, wheelchairs – anywhere urine and wetness may be a problem. The waterproof and washable sensor pad protects surfaces from damage. Mattress pads are available here.